Say hello at the Show! 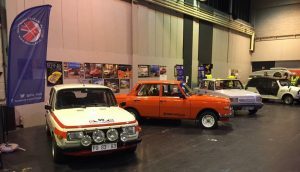 November sees the Club returning to the NEC for the hugely popular Lancaster Insurance Classic Motor Show – more than one million square feet of cars, autojumble, clubs and trade stands. Among the 3,000 cars on show will be a selection of our much-loved Eastern Bloc classics taking pride of place on the Wartburg Trabant IFA Club stand. As well as the Club Chairman’s Wartburg 353, van fans will be able to see a very unusual Barkas B1000 which is brand-new in the UK, sourced with the help of Hungarian IFA enthusiasts. This Barkas spent its first ten years in the DDR, then in Reunified Germany, before being taken to Hungary where it was used by a Skoda Car Parts business for events. Ten years ago an IFA enthusiast brought it to use at club runs and drive outs until she decided to sell it to its new UK owner. Also on the stand the Club will be displaying a 1.3 Wartburg Tourist. This rare model was brought to the UK some years ago but never registered. ‘Mr White’ joins ‘Mr Grey’ in the collection of Club member Ivor Burgess. IFA vehicles in DDR livery always attract attention and the Club will be showing a Trabant Kombi in Interflug colours, created as a tribute to the hardworking Trabis at Berlin’s Schönefeld Airport. 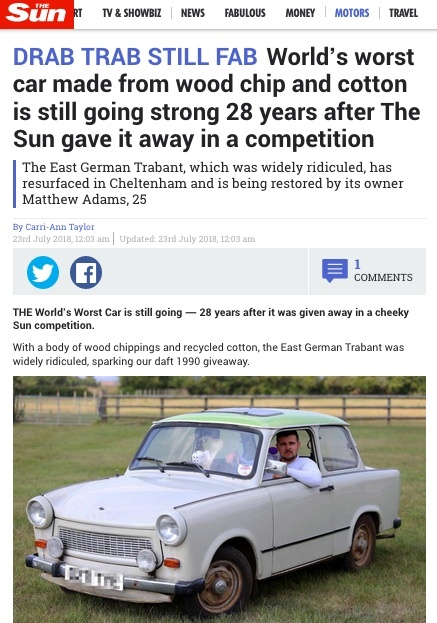 It’s still to be confirmed, but the Club also hopes that the stand will feature a Wabant – a Trabant with a Wartburg engine. Visit the Club in Hall 5, stand 140. The show runs from 10am on Friday 9 November 2018 to 5.30pm on Sunday 11th. The Club’s AGM will be held during the 2018 Red Oktober meet, taking place this year at the Wythall Transport Museum on Saturday 6 October. As well as the AGM, the meet includes a Cold War classic road run and a special vintage bus trip around the local area. The AGM’s formal business includes reports from the committee and a chance for members to ask any Club-related questions. There will also be a discussion about how best to celebrate the Club’s 50th anniversary next year. Not content with appearing in the Super Soaraway Sun (TM) Club member Matthew Adams has now shared his story with German tabloid newspaper Bild. The bad news is, you need a subscription to the newspaper to read it! A unique exhibition capturing life in East Germany before the wall came down is coming to the University of Chester in November. The photographs were taken by Harald Hauswald, who documented everyday life in Berlin, and selected by Stefan Wolle, director of the GDR Museum in Berlin. 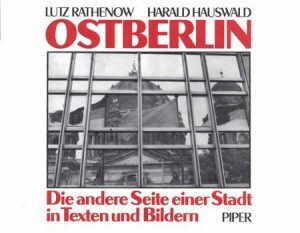 Hauswald often came under scrutiny from the Stasi and the GDR government, especially in 1987 when he published a collection of his work in the West, with fellow photographer Lutz Rathenow. 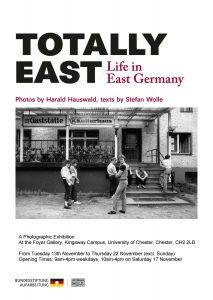 Totally East: Life in East Germany will be on show from Tuesday 13th November to Thursday 22 November in the Foyer Gallery, Kingsway Campus. Read more about Harald and his work in this interview with Deutsche Welle. The Club hopes to arrange a group visit to the exhibition on Saturday 17th November. Please visit the Facebook group for more details and to sign up. The Autumn 2018 issue of Two Stroke Times is hot off the press and heading for members’ inboxes. 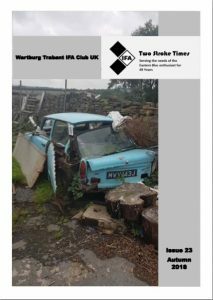 The new issue’s 32 pages are packed with event write-ups, updates on members projects, technical tips, and possibly the best Trabant fancy-dress you will see this year, thanks to Club member Tony Robson who entered his car in the Isle of Lewis Carnival as ‘Kim Jong Un on holiday’, accompanied by bodyguards and a suitably menacing rocket. Two Stroke Times is one of the benefits of membership – why not sign up and settle down for a good read? 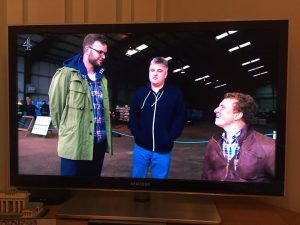 Club members watching Flying Across Britain with Arthur Williams on Sunday evening spotted a familiar face being interviewed about Lancaster bomber Just Jane at Lincolnshire Aviation Heritage Museum – SALT regular and Berlin-based member Axel Schmelzer. Axel said: “We saw Arthur when we went in the museum – we saw them filming and Steve Durrant told me that he had made a programm on the Mosquito. Find out what Axel thinks of the Lancaster here! 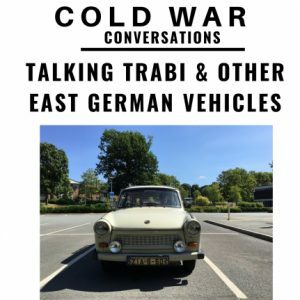 Our favourite car is the star of the latest epsiode of Cold War Conversations, a podcast run by Ian Sanders and Shane Whaley which aims to cover interesting aspects of the Cold War and speak to people who experienced it first-hand. 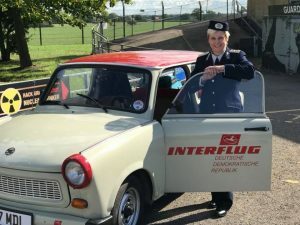 The podcast team travelled to Staffordshire to meet club members Alex Goffe and Mark Mullarkey for a chat about Trabants, other Eastern Bloc vehicles, why you should join the Wartburg Trabant IFA Club, and just what it is about Trabants that makes them so much fun. Alex and Mark take listeners for a tour under the bonnet and a short spin on local roads. The podcast is just under 40 minutes and a great listen. Tune in here! 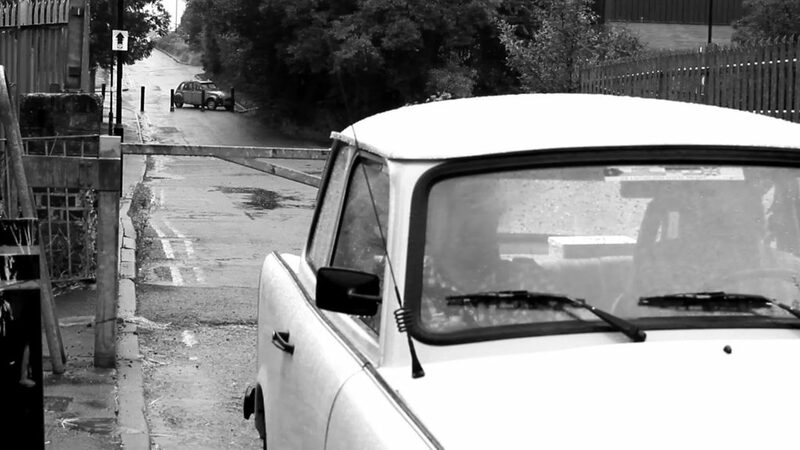 Club members spent a rainy Saturday afternoon helping turn a Coventry back road into a Berlin border crossing for a music video starring the Club’s own Elizabeth Sayle and Ivor Burgess. 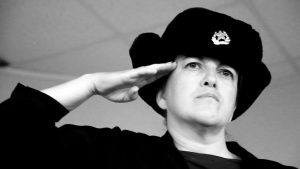 Elizabeth plays the eponymous heroine of a track called “Russian Spy” by Coventry band Eyes of Isabel. She explains: “We went to Cars and Coffee at Coventry Transport Museum one Saturday morning and Andy McGeechan (the director) came up to me and started chatting as soon as he saw the Wartburg. We were chatting about our shared experiences of Berlin as students – he’s older than me so was lucky enough to experience it before the wall. Elizabeth plays a spy who meets a sticky end, while on Saturday Ivor was a stern-faced border guard, checking her passport as she crossed from West to East watched from a distance by ‘Eyes,’ her minder. Robert Cannon and Alex Cheasley brought Margot the Trabant to help create the illusion, while Hortense the 2CV lurked on the Western side of the crossing. 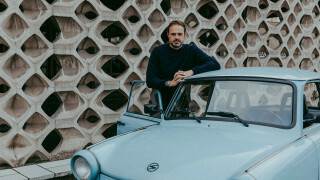 Members as interested in the history of the DDR as they are in the best oil ratio or the advantages of electronic ignition should tune in to Yesterday tomorrow for the latest epsiode in Jamie Theakston’s Fobidden History series. The Stasi: Behind the Berlin Wall will air at 8pm on Thursday 26 July. 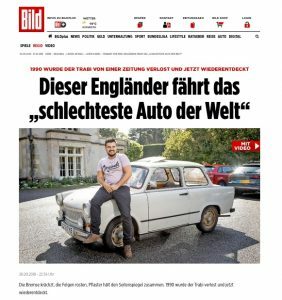 New Trabant owner Matthew Adams got more than he’d bargained for when he posted a photo of his 1984 601 s on the Supporters of the Wartburg Trabant IFA Club UK Facebook page for members to admire. Club guru Peter Frost was able to tell him that the car was one of the first brought to the UK after the wall came down in 1990 and had been imported by The Sun as a prize in a readers’ competition to “win the world’s worst car”. Peter knew this because he’d bought the car from the winner! Both Peter and Matthew were featured in today’s edition of the paper, with a longer write-up on line.